The most senior lawyer working for the inquiry into child sexual abuse in England and Wales is considering resigning, the BBC understands. Ben Emmerson QC is believed to disagree with its new chairwoman, Professor Alexis Jay, over its future. The Times reports that he wants to reduce the inquiry's workload, but Prof Jay and the home secretary have both said its scope will not be changed. Prof Jay is the fourth person appointed to lead the inquiry. An inquiry spokesman said Mr Emmerson had not resigned as counsel to the inquiry, while Mr Emmerson told the BBC he was not in a position to comment. 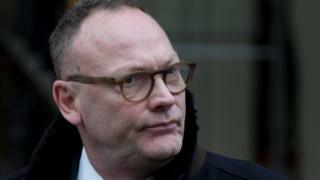 BBC political correspondent Glenn Campbell said losing Mr Emmerson would be "another serious setback" for the inquiry. The inquiry was set up to examine whether public bodies including the police have failed in their duty to protect children from sexual abuse. It will also examine claims of abuse involving "well-known people". Claims of paedophiles in Westminster in the 1980s sparked the inquiry, and the first two women chosen to chair it resigned over claims they had links to senior figures at the time. The third chairwoman, New Zealand judge Justice Lowell Goddard, resigned last month, citing the "magnitude" of the inquiry and the "legacy of failure" from its beginnings. She was replaced by Prof Jay, who previously led the independent inquiry into child sexual exploitation in Rotherham. Mr Emmerson, who represented the widow of Russian dissident Alexander Litvinenko at the inquiry into his death from radiation poisoning, is a deputy High Court judge, a visiting professor of human rights law at Oxford University and a leading international lawyer. Is this the most toxic job description in public life?